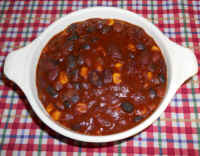 We prepare this recipe in our 6.5 quart slow cooker, which is nearly full when completed. If you want to make a smaller batch, cut the recipe in half. 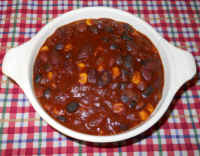 The 3-bean chili con corny is also great as leftovers, so we don't have to cook every day. We begin making the chili con corny the evening before we want to eat it, by cleaning and washing the black, kidney, and pinto beans and placing them in the slow cooker pot with 12 cups of cold water. Cover the pot and simmer on low heat over night. In the morning add the tomato paste to the pot and mix well. Peel and wash the onions, and cut them in chunks and place them in the container of a high speed blender. Wash the jalapeno peppers and remove the stems, and place in the container with the onions, or substitute chipotle peppers if you like the smoky flavor. Cover the blender container and run the blender at high speed until the mixture is creamy smooth. (NOTE: If you are not sure how spicy you like your chili, we suggest starting with one pepper, and tasting the onion blend before adding another pepper). Add the onion pepper mixture to the slow cooker pot, with the chili powder, cumin, basil, and cilantro, and mix well. Or, you could finely dice the onions and place in the pot, in which case we suggest using cayenne pepper or hot sauce to taste instead of the whole hot peppers, which you can add to the pot along with the other seasonings. Place the frozen corn in a microwaveable covered dish, and defrost and warm the corn before adding it to the chili pot, mix well, cover, and continue simmering on low heat for about another 2-3 hours.